The Urban Redevelopment Authority (URA) released the flash estimate of the property price index for private residential property for 3rd Quarter 2018 today. 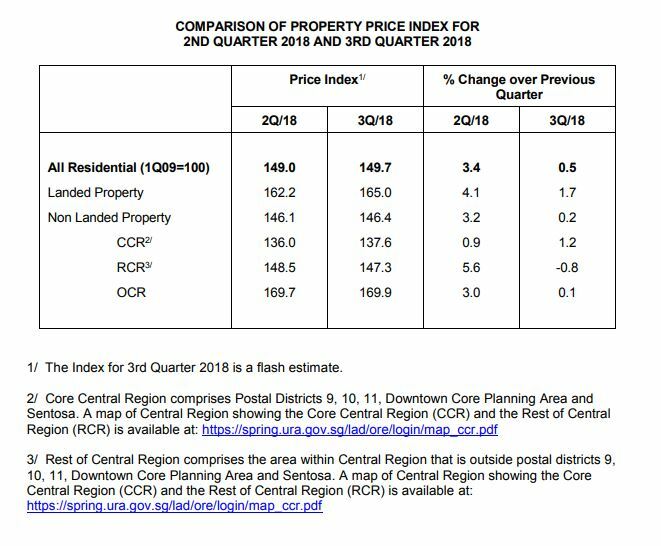 Overall, the private residential property price index increased 0.7 points from 149.0 points in 2nd Quarter 2018 to 149.7 points in 3rd Quarter 2018. This represents an increase of 0.5%, compared to the 3.4% increase in the previous quarter. 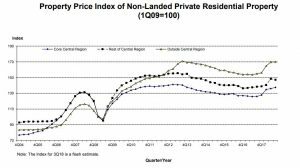 Prices of non-landed private residential properties increased by 1.2% in Core Central Region (CCR), compared to the 0.9% increase in the previous quarter. Prices in the Rest of Central Region (RCR) decreased by 0.8%, after registering an increase of 5.6% in the previous quarter. 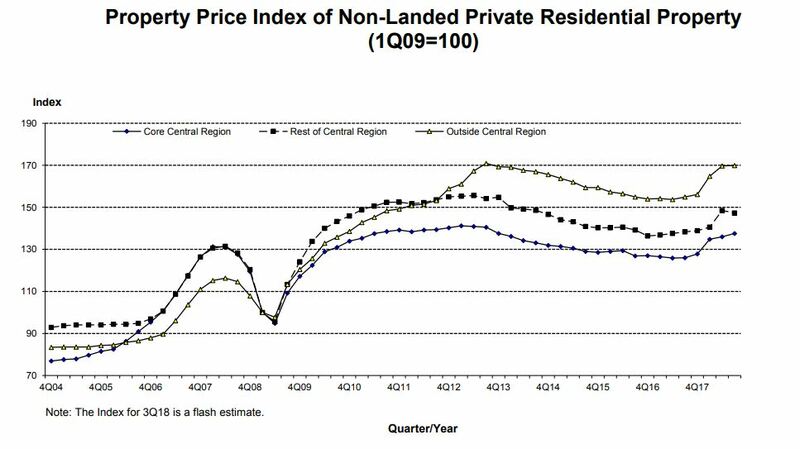 Prices in Outside Central Region (OCR) increased by 0.1%, after registering a 3.0% increase in the previous quarter. The flash estimates are compiled based on transaction prices given in contracts submitted for stamp duty payment and data on units sold by developers up till mid-September. The statistics will be updated on 26 October 2018 when URA releases its full set of real estate statistics for 3rd Quarter 2018. Past data have shown that the difference between the quarterly price changes indicated by the flash estimate and the actual price changes could be significant when the change is small. URA advised the public to interpret the property price index flash estimates with caution. 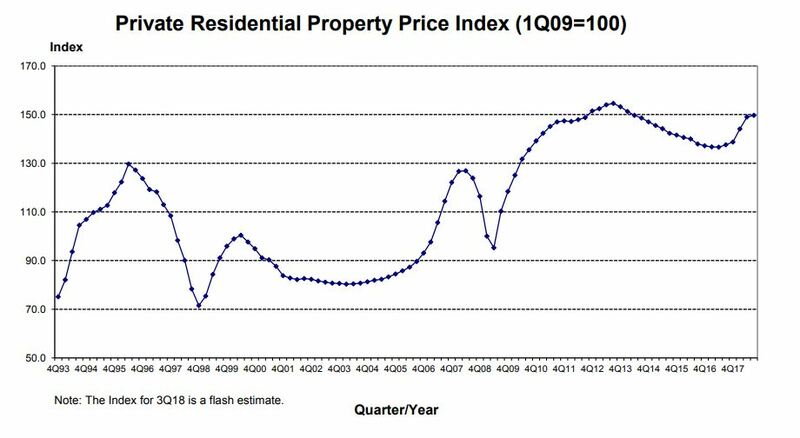 “Based on flash estimates, the URA’s private residential property price index rose 0.5% in 3Q18, a significant moderation from the 3.4% rise in the previous quarter. The landed segment was more resilient in 3Q18, with the index rising 1.7%. Landed property prices corrected the most between 3Q13 and 2Q17, which has drawn buyers to this market segment. In spite of having risen in the past year, prices of landed homes are still seen as relatively attractive by many buyers which has led to transactions at firm prices. Among the non-landed segment, the index for CCR registered the highest increase of 1.2%. Compared to RCR and OCR, CCR had the least new launches in 3Q18, i.e. 8 St. Thomas which has a high median price of $3,226 psf. Consequently most prime district buyers had to explore opportunities in the secondary market, which accounted for 76% of CCR transactions in 3Q18 (based on caveats in URA Realis to-date), driving up secondary market median price from $1,838 psf in 2Q18 to $1,919 psf in the third quarter. The index for non-landed homes in OCR inched up a marginal 0.1%, indicative of prices remaining flat in the third quarter. New launches in 3Q18 at affordable moderate pricing contributed to the price stability. Riverfront Residences, which had a median price of $1,309 psf, and accounted for about 72% of new sale transactions in OCR, had a significant impact on OCR prices in 3Q18. Prices for non-landed homes in RCR retreated in 3Q18 as shown by the -0.8% decrease in the index. Pricing was driven mainly by the primary market which accounted for about 74% of transactions in RCR. The third quarter saw launches at lower prices and more new sale projects recording sales at lower prices. In 2Q18, three projects ie The Verandah Residences, Margaret Ville and Amber 45, were launched at median prices above $1,800 psf while launches in 3Q18 were below that price level. Out of 18 new sale projects that had transactions in 2Q18 and 3Q18, 72% of them recorded lower per square foot prices. Consequently, median prices of new non-landed homes in RCR fell from $1,885 psf in 2Q18 to $1,706 psf in 3Q18. 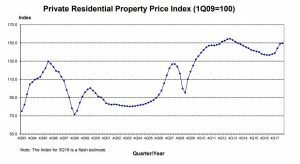 “Based on the preliminary estimates released by the URA for Q3 2018, the private residential property index increased by 0.5% to 149.7, compared to the 3.4% increase in the previous quarter. This is a clear indicator that the cooling measures which took effect on 6 July 2018 have managed to curtail the exuberance in the market. Nonetheless, prices in the CCR still registered a healthy 1.2% increase, while prices in the RCR have bucked the trend to register a decline of 0.8%. There has been anecdotal evidence that some previously launched residential projects has softened slightly on their pricing in order to move units.